Given the extent of the Ebola virus outbreak in West Africa, transport of an infected individual to the US was bound to happen. The case is an adult who had contact with an Ebola virus-infected woman in Liberia, then traveled to Dallas. He had no symptoms before arriving in the US and therefore did not likely transmit the infection to airplane passengers. He sought medical care on 26 Sep 2014 and was admitted to Texas Health Presbyterian Hospital 28 Sep 2014 where he is currently under isolation. Samples sent to the CDC tested positive for Ebola virus. There are excellent summaries of the events at ProMedMail and the CDC website. Apparently the Dallas patient told a healthcare worker during his first hospital visit that he had been in Liberia. This information was not transmitted to his physician. The word ‘Liberia’ should have set off alarm bells. Furthermore, if the physician did not receive the patient’s recent travel history, he/she should have requested it. There is no room for error when dealing with Ebola virus infection. Why is it important to stop travel out of the affected countries? While I’m confident that the US can detect and properly contain imported Ebola virus infections, not all countries will be able to do so. There are dozens of other countries that are unprepared to deal with an infected case, from diagnosis to isolation to treatment. I can easily imagine infection quickly getting out of control in such countries: millions are at risk. While the economics of stopping air travel out of Liberia, Sierra Leone, and Guinea will be severe, they cannot approach the devastation of having outbreaks burning simultaneously in multiple countries. Update: NPR has a good explanation of the reproductive index, or the number of persons who can be infected by another infected person during an outbreak. For Ebola virus, this number is 1-2. This low number is why quarantine can be effective. Not to mention an increase in travel for the Haj. I was just listening to NPR a few moments ago and they said that Saudi Arabia isn’t permitting visas to citizens of Liberia, Sierra Leone, and Guinea. And also, not to mention paranoia. In these cases, what people must do is to read, to learn, to analize, and to communicate how virus is spread. We need a scientific culture in our societies to avoid propagating fear and promoting knowledge. “It is puzzling that travel (excluding healthcare workers) out of the affected West African countries is still permitted.” I agree; however, this seems to be subject to political pressures more than economic. Quite honestly, this can no longer be bottled up, even if airports in the primary afflicted countries (Guinea, Sierra Leone and Liberia) are completely closed. The ill with enough resources will simply migrate to airports in neighboring countries and fly to their destinations. Without a proven vaccine/treatment, I see nothing that can restrict this outbreak. Just because some people in a country have an infection, the typical racist, police state, view is to call for a complete blockade of the country. This is despite lack of proof that Ebola is highly infectious (there is ample evidence to the contrary). Next time there is whooping cough in the US, I wonder if there will be calls for the blockade of the country. I’ll just reiterate one of my arguments here, as nobody else seems to be raising this crucial point: a ban on travel out of a country is a de facto ban on travel into it. No airline is going to send flight crews into a place they can’t get them out of. If we stop flights from these three countries to the US, it will become virtually impossible to send supplies and people there to help, and the epidemic will spiral even further out of control. Let us allow a ban’s legality be decided by the courts. By the time they get around to making a decision, Ebola will be history or Pandemic despite our pitiful efforts to contain it with a dollar short and a day late travel ban. But something is better than nothing and might buy us enough time to come up with a workable vaccine. Admit that this outbreak has already exceeded our ability to gain control of in Liberia and Sierra Leone. Admit that spread to neighboring countries is likely inevitable. Dallas was our wakeup call. If banning travel into this country really going to stop the transmission of the disease not that there have been cases within the borders of the us? No. People making these assertions, no matter how credentialed thay are are not taking some factors into consideration. The biggest one being illegal immigtration. If someone wants to come to this country they will get here ebola or not. WE dont have the military resources to close off every section of border. You dont get it. Closing the borders will not stop ebola in the us. Its already here and has been here since the late 70s and early 80’s. This is not the first outbreak of Ebola in the US. The Hot Zone and The Virus Hunter page 214 talks about the history of the first outbreak and how it was dealt with. The key factor that is preventing the experimental treatment from getting to the people in Africa and elsewhere is the drug company that made it didnt make enough of it. Besides viruses cant be stopped by closing borders. I wouldnt even consider that a valid source of information. and the experts have already came out and said that the authors of the article and the one in the WSJ took their quotes out of text plus some of the people quoted were not experts on Ebola. 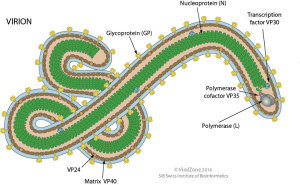 Previous post: Could the Ebola virus epidemic have been prevented?